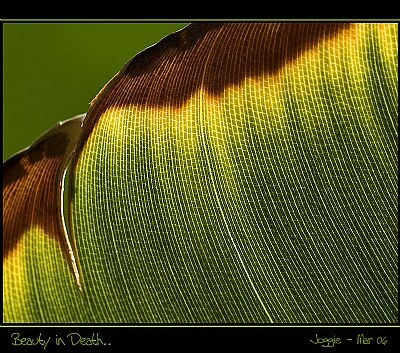 Image Title: Beauty in Death . .
About The patterns and colour contrast of the edge of this dying Strelitzia leaf fascinated me. In nature beauty is often more pronounced during death than in life. It feels like this amazing wave just an amazing uplifting feeling. The colors came out beautiful. Great textures and tones here dear joggie well done my friend !! But form now they go on living thanks to you! it's a pleasure to admire your photos; macro full of details and wanderful landscapes! Nicely done, Joggie! It is interesting to see the transitions in the leaf! this is wonderful as tone and texture. again i impressed with your creative works. Jog - the backlight works wonders here. Excellent comp and dof. the details and colors are just marvelous dear Joggie!!!! well captured and presented!!!! !very well done!!!! colours. Excellent abstract composition, well captured idea!